Endeavor for Excellence (E4E) is MedicalGPS' service improvement program designed especially for physician practices, delivered via a series of live, on-line webinars, sequenced over six-week time frame. MedicalGPS' senior executives lead groups of up to 25 practices, concurrently, through a hands-on interactive program that enables practice managers and other local leadership to effect positive change within their respective practice(s). Following E4E's 10-step service improvement process, physician practices often see performance improvement within three to four weeks after beginning the E4E program. E4E is focused on assisting practice mangers with implementing E4E's 21 Best Practices, resulting in tangible, measurable improvements to both practice workflow and customer service quality levels. Physician practices that embrace E4E Best Practices realize improvements across several M3-Patient Experience® (M3) performance metrics, including; Appointment Access, Message Turn-around Times, Office Wait Times, Receptionist Courteous, Telephone Handled, Recommend to Family and Friends, and other M3 metrics. 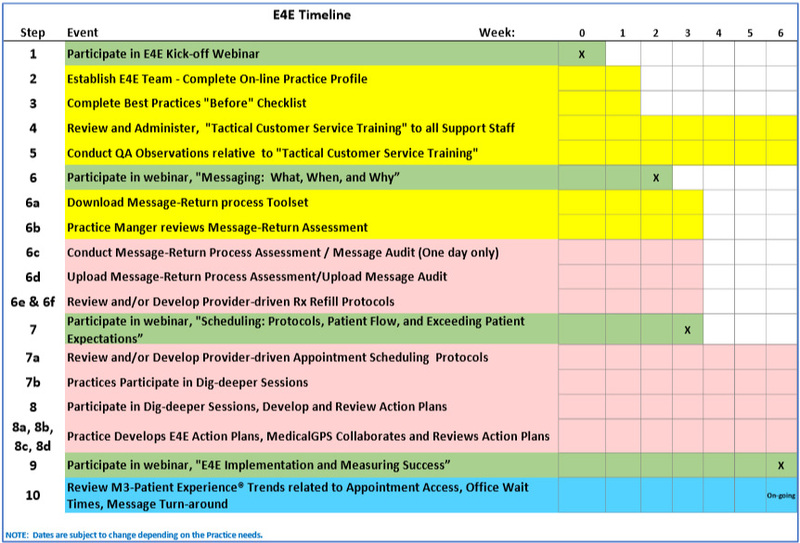 The E4E process starts with a 30-minute, live webinar, attended by practice managers, practice supervisors, practice team leads, and executive leadership as needed. After each E4E live webinar practice managers are assigned "To-do" items, or tasks, that are to be completed before the next E4E webinar, or by predefined dead-lines. Step 6: Participate in E4E Webinar, "Messaging: What, When, and Why". Step 7: Participate in E4E Webinar, "Scheduling: Protocols, Patient Flow, and Exceeding Patient Expectations". Step 9: Participate in E4E Webinar, "Sustaining Effective Implementation and Measuring Success"